Welcome at Burning Man's "Airport"
View the Photo Gallery for this post here. Every year in late summer, a very large group of independent thinkers, free spirits, artists and stout adventurers take over a small corner of Black Rock Desert in Northwestern Nevada for an festival of eclectic, communal celebration called Burning Man. People from all over the world migrate to the "playa", one of Nevada's famous dry lakebeds known for extreme heat, fine dust and brutal windstorms. If you've never heard of Burning Man, I'm sorry, but I am not about to try to describe this event further. I am sure it is one of those events that cannot be described in words without experiencing it first-hand. No, this two part post is not so much about the event as it is the event's "airport". I recently met Dean Siracusa on Twitter through a chat with his GF @ShelleyDelayne, and found out Dean has been a volunteer at the playa airport for years. I have always carried a keen fascination for Burning Man, and the "burners" who attend, and secretly wish I could also make this scene. Those who know me know that on the inside, I am at one with the Burners, but on the outside, my short hair and almost boring attire usually makes people think "Narc", but "Burner". So in chatting via email with Dean, I discovered that Burning Man has an entire aviation component that is very, very interesting. He graciously granted me an interview, and here is part one, where Siracusa describes what the actual event is like, and what drew him there in the first place. 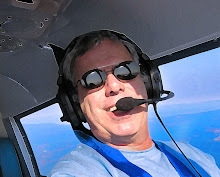 World of Flying: Give me your aviation background on yourself. Siracusa: "I got my pilot's license back in 1999 (and later, my instrument rating) and bought my first airplane, a 1980 Cessna 172N. I put 1,000 hours in five years of flying my Skyhawk and realized that I should probably get something faster. But, I didn't want to sacrifice safety for speed. A lot of the high performance, complex aircraft have not-so-hot safety records (in-flight airframe failures, etc...) I came across the Meyers 200 in the Aviation Consumer's Used Aircraft Guide. From the moment I saw it and read about it I fell in love with them. They're stout (made of steel and covered in aluminum), fast (180 knot cruise), slow (stalls at 52 knots) and have a great safety record (no airworthiness directives on the airframe and no in-flight airframe failures, ever). They're fun to fly too! The hard part was finding one since only 130 of them were made and the owners that have them usually keep them forever. After two years of searching I found a great one and I've been flying it for a while now. The funny thing is that I still fly about 200 hours a year. 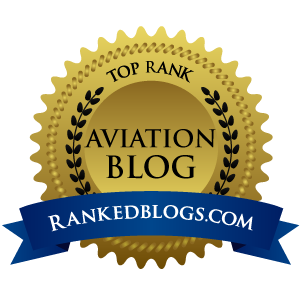 What I realized was that having a fast airplane allows me to go more places in a much shorter amount of time." 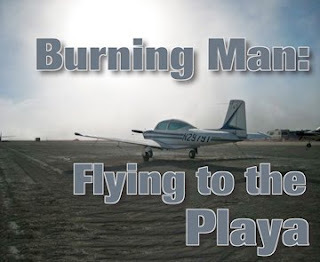 World of Flying: Describe to my readers what Burning Man is all about. Siracusa: "Burning Man’s official website says “Trying to explain what Burning Man is to someone who has never been to the event is a bit like trying to explain what a particular color looks like to someone who is blind.” What started as a small, impromptu gathering in San Francisco in 1986 has turned into a celebration of individuality, self-reliance and creativity that covers 12 square miles (almost 8,000 acres) and has a greater population than most cities in Nevada. The perimeter of Burning Man is shaped as a pentagon, surrounded by a nine-mile long, four-foot high fence (known as the trash fence). There are only two ways in and out. The main entrance from the road is the where most people arrive. The only other entrance is through the airport, located just outside the trash fence. In the very center of the pentagon is “The Man” – a towering figure you cannot miss. During the day, he is prominent by his height alone, a 40-foot tall man on top of a 50-foot tall base. At night, he is outlined by neon lights. The city forms a 2-mile-diameter semi-circle around the Man. The main interior circular road is called the Esplanade and is filled with all kinds of unique theme camps. Between the Esplanade and the Man is an open, no-camping area where artists display and create all kinds of amazing art pieces. Outer circle streets are named in alphabetical order going outward from the Man. The names themselves are theme-related and change every year, but they are always alphabetical and posted on street signs." World of Flying: How did you get involved in helping to run the airport, and how long have you been doing that? Siracusa: "In 2000, a friend from San Francisco said that I should go to Burning Man. I'd never heard of it so I did some searching and it sounded like fun. It was the first year that they had an official airport and I've always loved adventure. There was very little information about the airport itself, other than to say there was one. The Burning Man site has always had good information on what to bring in order to survive your stay on the playa. So, I packed up the plane as best as I could and flew up there. I was worried that without actual coordinates (there weren't any posted that year) I'd have a difficult time finding it. But, I was amazed when I got near the Black Rock Desert that it stood out so clearly. I landed, tied the plane down, unpacked and went "in the city" to have some fun. I've been going back ever since. I've been helping the airport out there in various ways since I first arrived on the playa back in 2000. The thing about Burning Man is it is a Participant Only event. No spectators are allowed. You need to do something there besides just ogle the art or pretty girls. My love of aviation made helping the airport team an obvious choice in my participation. The entire airport team is made entirely of volunteers and it really is a great group. In fact, one of the big reasons I keep going back is to see my friends that I may only see once a year. Dealing with all kinds of crazy situations in a remote area with extreme weather conditions definitely helps with bonding." World of Flying: What kind of planes fly into Burning Man? Siracusa: "Back in 2000 there were only around 20 planes. Last year there were around 200. Everything from little Piper Cubs to Pilatus PC-12s and even Cessna Citations show up. Lots of vintage planes and even an Antonov AN-2 Colt flies out." World of Flying: What is the weirdest thing you have ever seen fly into Burning Man? Siracusa: "I think the Antonov is pretty crazy. There's a guy that flies out in a Cessna 180 on amphibious floats. That's kinda funny to see since the Black Rock playa is in fact a dry lake. Another guy flies out in a Yak 52 aerobatic plane and does some great maneuvers near the event. The area is right beneath an MOA (Military Operations Area) so we occasionally get our own little military air show. Everything from F18's doing aerobatics to C-130's and C-17's doing low and slow fly-by's." Goodness me, Could This be Industrial Disease?